Almonds : Why They Are the Best Dry Fruit? Almond is perhaps the most popular dry fruit consumed around the world. People consume it as food, as medicine, and for various other purposes. The origin and usage of almonds can be traced back to (3000-2500) BC. It is found in abundance in the Middle East starting from western Pakistan stretching up to Turkey. Nowadays, it is cultivated in almost every part of the world, with some countries making huge profits by exporting large quantities of this amazing nut. The nutritive value and health benefits of almond make it one of the most demanded and the most consumed nut. Let's see why we should include almonds in your daily diet and how these nuts can help us improve our overall health. Broadly, almonds can be divided into two categories, viz., Sweet Almonds and Bitter Almonds. The former is mostly consumed in food items while the latter is used in medicines in some parts of the world. Countries like Spain, Turkey, Italy, Iran, and Morocco are some of the largest producers of almonds. California, USA produces about 80% of world's almonds. The most preferred way to consume almonds is in raw form (ripe nuts) or in the desserts. Roasted almonds, almond butter, and almond oil are some other consumable forms. Good for the heart - Almond contains a lot of monounsaturated fat that helps in lowering LDL (bad) cholesterol. Several studies have shown that almonds effectively lower the bad cholesterol and helps in increasing the amount of HDL (good) cholesterol. Daily consumption of almonds keeps your heart in a healthy state and also aids in preventing several types of heart diseases. Good for brain and complexion - In several South-Asian countries like India, almonds are considered good for the brain and nervous system. It is known to improve memory and recalling capacity. Almonds also contain a good amount of Vitamin-E that makes them an essential part of massage oil and skin treatment lotions and creams. It is known to be extremely good for skin and for improving the complexion. It helps reduces skin-born diseases and is known to prevent skin cancer. Good for diabetics - Several studies have shown that almonds can help reduce the weight of individuals taking a good amount of these nuts in their regular diet. Scientific studies have shown that skin of almond seed helps prevent absorption of a lot of carbohydrates controlling the level of insulin. This keeps the blood sugar level in the healthy state keeping diabetes under control. Good for shedding weight - Taking a generous amount of almonds in daily diet helps you control your weight. They can easily replace quick snacks like chips and cookies helping you to keep your junk food eating activity, in control. Good for hair and bones - Presence of good amount of magnesium, phosphorous, and potassium makes them an ideal food to strengthen hair and bones. Women nearing menopause must include almonds in their diet because the presence of high phosphorous helps prevent osteoporosis that is quite common after menopause. Eating an ounce (approx. 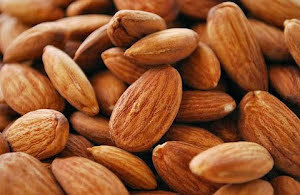 23) of almonds daily gives you the maximum health benefits from this amazing nut.